Having learnt in the Sun in Astrology Primer what our conscious part is about and how it is behaving, it's time to see what's happening with the unconscious. Relationships are not always conscious. Many times we tend to re-act instead of act, which means to simply reflect others' actions, instead of thinking first and acting consciously. This automatic behavior is a thing related to the Moon. It represents a more primal way to behave, like animal nature does: getting together, keeping safe close to the herd, the family, the ones who support us. It's a hard world out there to stand all alone, even based on your Sun. Moon is about creating a cozy and safe environment. Acceptance, embrace of others and a sense of belonging are all part of the picture. Developing habits, routines and counting on instincts is important for it. When the danger comes, we usually don't have much time to think about it. So, we better have some damn good instincts. We better remember what binds us, tell stories in the night, remember our ancestors who helped, and trust the elders for their knowledge. All these are issues for the Moon. But there is more to it. When in danger, we better have someone there who can lead us quickly out of the crisis and let's be obedient enough so we won't cause havoc. 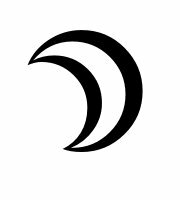 The Moon acknowledges power and in that sense reflects the Sun. The supervisor and the team, the boss and the workers, the patriarchic father and the family are all picturesque representations of the Sun/Moon dipole. If we decide to maintain the patriarchic traditions, Sun and Moon also represent husband and wife. Father makes the decisions, mother is mild, obeys, but softens the decisions, before implementing them to the children. The Moon is thus also the mediator; the one filtering the decision and rounding any sharp edges. It is also the one who adjust things to circumstances; gives a flexible form to the plan. In the elder days, male hunters brought the meat to the tribe and said: Give the meat to the women, they'd know what to do about it. When reflecting too much, though, you might lose yourself at some point -- the "I" we mentioned when describing the Sun. So, many times the Moon is moody. It runs out of its own energy and needs to draw back to re-charge, by re-connecting to the internal Sun; to what the "I" wants. This is why at some point, we feel we need to abandon the herd, leave the family, resign from the company and seek our own path away from the group. This is the process we call individualization. As a person, the Moon may be the mother, the little sister, the nurse, the cook, the nutritionist, the gardener. As a location, the Moon could be associated with places close to water, might be the river or the sea. As an occupation it has to do with naval jobs, agriculture, food and care. Nurses, farmers, restaurant owners, sailors, fishermen, babysitters can be associated with it. In politics it is associated with majority and the public opinion. Positive qualities: maternal love, instinctive understanding of needs, protection of family, love of home, emotional support, security, trust, meeting needs, care, imagination, romance. Negative qualities: hypersensitivity, extreme receptivity, excessive introversion, volatility, overprotection, being oversensitive, moody. This article copyright © 2012 Vassilis Papadolias. All rights reserved. Reproduction without permission prohibited.